A lady friend and I shared a Seminole Pumpkin we got at VarriGreen Farm in Okeechobee Florida. It was delicious, and we got lots of seeds. My friend Holly suggested I try to grow them over the South Florida summer months when only the most heat tolerant crops will grow. In July I put a few seeds in a 50 sq. ft. section of my garden. No one bothered to warn me about how large this plant gets! It has taken over three 50 sq.ft. sections. It wants two more, but I am pushing it back. It has taken over the fence around 4 sections, and I have to keep cutting it away from the last two of three gates. It keeps growing them shut. I have put in 4 bamboo teepees. The pumpkin monster has swallowed them up. It has been flowering for at least a month now. 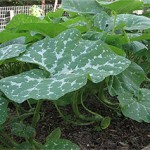 I don’t like to count my pumpkins before they’re harvested, so I say only that this is so far a tremendous plant. 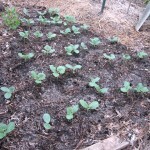 I manured that garden with Alpaca/Pony manure about a month before I planted the seeds. Should it make a harvest I will photograph that too. Wish me good luck gardeners, and I will wish you good luck too! 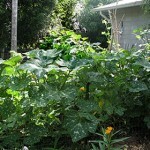 See into the future of this Seminole Pumpkin Garden. I bet they make great desserts too. Do you know the recipe for a pumpkin dish that is so tasty and sweet it should be a dessert. My wife and I have a dish prepared that way sometimes. She is a bionic cook, and organic gardener too.. You probably would like her. 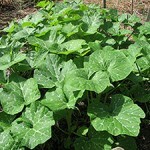 We grow organic seminole pumpkins here in the NC mountains. It’s true-they take over the yard-so you need a lot of space-probaably 4 times the area. My husband makes pies and will roast them in the oven with olive oil and sea salt-slice them up and they make an excellent veggie. Thanks for your comment Bette. I love pumpkin pie!